A single rooting method that works across all devices is a dream that may never come true, but SuperSU’s developer Chainfire is making sure that at least the most popular Android phones could all be rooted by one single method. 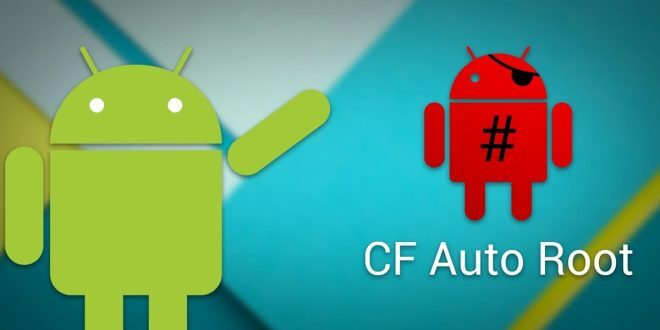 His root utility called CF-Auto-Root works with over 300 different Android smartphones. 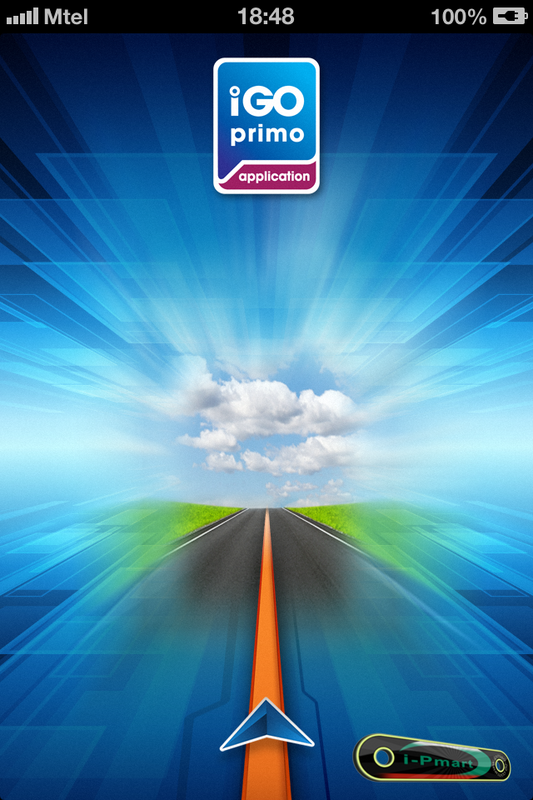 A list of popular smartphones that long is bound to have many devices from Samsung. The process requires the use of a PC though so it’s not as easy as those once click root methods, but it is safe considering the source of these root exploits. Chainfire has recently updated hundreds of CF-Auto-Root binaries for Samsung devices running on Android Nougat, meaning you can root these devices safely, and with ease. CF-Auto-Root makes the process of rooting much much easier than it normally would be. It is still very much a work in progress though as evident from the message (BETA: All this is still in testing!) displayed at the top on its official website. Rooting an Android smartphone is a risky process, regardless of how simple it appears to be. If everything does not go as planned, you might end up with a device that is stuck in a boot loop or just wouldn’t turn on. Rooting also voids your warranty, just so you know. We, at DroidViews, are always ready to help but don’t take any responsibility for your actions. You must understand the risks involved and therefore proceed only if you are ready to take responsibility. If your device storage is encrypted, CF-Auto-Root will wipe your entire data. It is thus advised that you backup all your data on your PC or on an external storage. Download the correct CF-Auto-Root file for your phone model number from here. Once you have downloaded the correct file for your device, you can proceed forward with the guide to root your Samsung device. Enable OEM Unlock and USB Debugging. The latest version of Odin. Download the correct CF-Auto-Root file for your device and extract the zip to get a file with .tar or .tar.md5 extension. Press and hold the Home + Volume Down + Power buttons for a few seconds to boot your device into Download Mode. On Samsung Galaxy S8, you need to use the Bixby + Volume Down + Power keys. 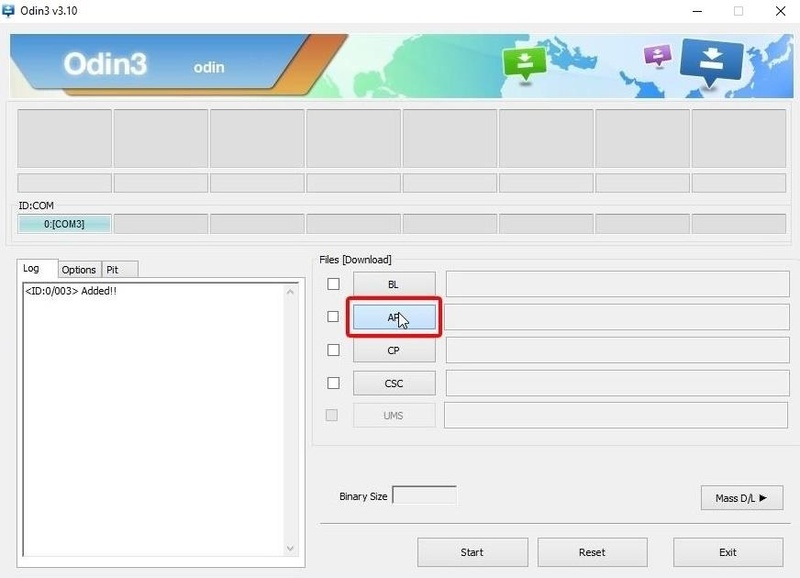 Launch Odin on your PC with administrative rights. 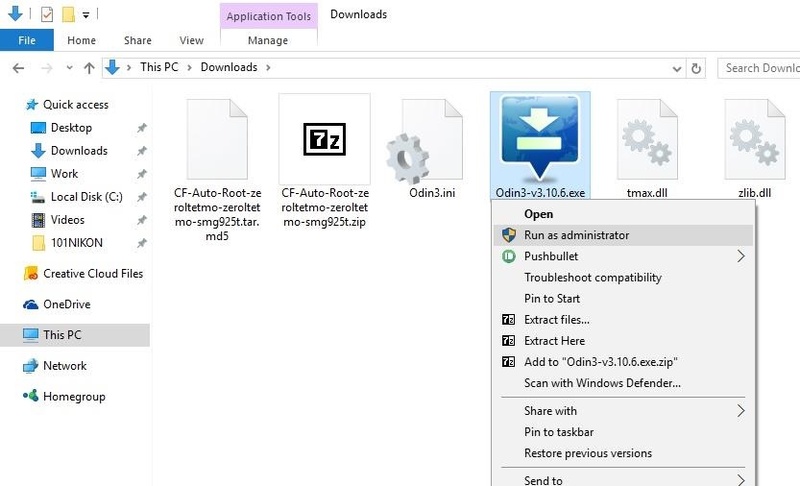 To do this, right-click on the Odin Exe file and click Run as administrator. 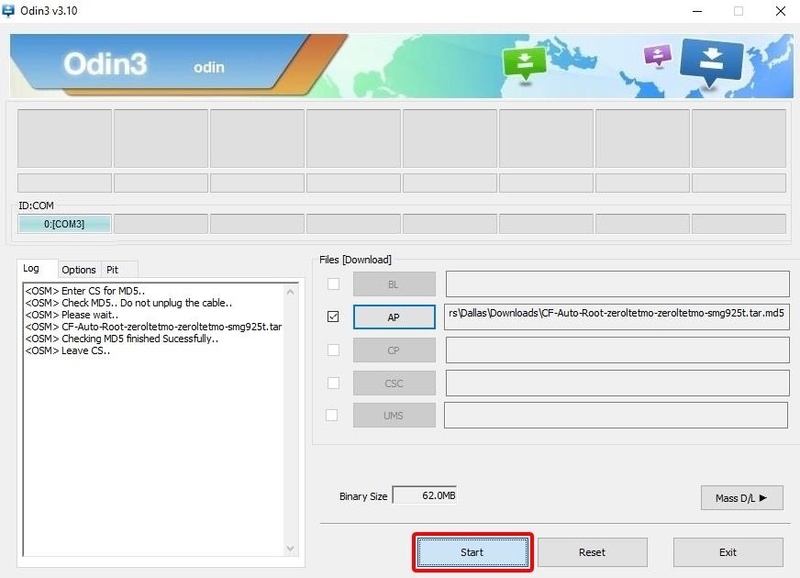 Connect your device to the PC with a USB cable, the ID:COM Port in Odin should turn blue. Click on the AP button and add the CF-Auto-Root file. It’s the .tar or .tar.md5 file extracted earlier. Click on the options tab and make sure only Auto Reboot and F.Reset Time are selected. When the process finishes, you will see the message PASS! displayed in ODIN. Your device should reboot automatically at this point. The first boot might take a while but when your device boots up, you should find the SuperSu app in your app drawer. If you need some help or even more information about CF-Auto-Root, you can visit the dedicated development thread on XDA. 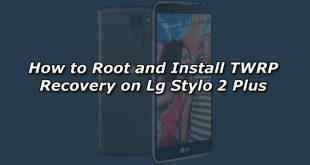 On this thread, you can also request the developer to add root exploits for your device if it is not already supported by CF-Auto-Root.